Mon, Mar 18, 2019, 08:30 pm SL Time, ColomboPage News Desk, Sri Lanka. 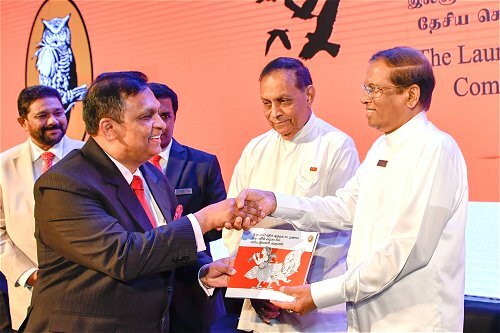 Mar 18, Colombo: Sri Lanka President Maithripala Sirisena today ceremonially launched the five-year National Action Plan for Combatting Bribery and Corruption in Sri Lanka 2019 - 2023. The Speaker, the Leader of the opposition, Parliamentarians, religious leaders, members of the diplomatic corps representing over 50 countries, Officials of International Organizations, senior public officials, members of the civil society representing all segments of society participated in the event. Chairman of the Commission to Investigate Allegation of Bribery or Corruption (CIABOC) President's Counsel Sarath Jayamanne handed over the Five Year Action Plan on the elimination of Bribery and Corruption to the President at the event. Speaking at the event, President said when he was elected by 6.2 million people a key point of his election manifesto was the eradication of bribery and corruption. The President said during the last four years a number of steps have been taken to fulfill that goal and strong decisions which had not been taken by any other government had been taken with the aim of ending bribery and corruption. He pointed out that even though there was an explicit program to crackdown on bribery and corruption, a problematic situation has arisen in the country in enforcing the law against the offenders. The Presidential Commission appointed by him to inquire into the biggest bond scam in the history of the country has come to the attention of the people of this country changing the distrust and perceptions public had in presidential commissions. The President said the officers who carried out the investigations had to face various challenges and problems and sometimes they were even investigated and he considered the attitude was a weak situation of the state administration. Speaking further the President said that the five year plan has been prepared with the aim of achieving economic, social, cultural, environmental and sustainable development by eliminating fraud and corruption in the country. Speaking about the Central Bank bond scam, the President alleged that Singaporean authorities were yet to support the extradition of bond scam fugitive Arjuna Mahendran. The President said he held talks with the Prime Minister of Singapore on the extradition of Mr. Mahendran but the Singapore government is yet to clarify whether former Central Bank governor was residing in their country or not. He claimed that the government of Singapore was displaying a hesitant approach despite INTERPOL alerts being issued on Mr Mahendran and despite assurances by the Singaporean Prime Minister to extend support with regard to the extradition. "The Singapore government should make a clear statement about its policy regarding the handover of the main respondent to the Sri Lankan government," he added. The launch of the National Action Plan (NAP) was in recognition of Sri Lanka's obligations under the United Nations Convention Against Corruption (UNCAC), which was constitutionally recognized in the 19th Amendment to the Constitution. The compulsory recommendations of UNCAC and Sri Lanka's commitments as per the Open Government Partnership warranted the formulation of a comprehensive plan to combat bribery and corruption in Sri Lanka. According to the CIABOC, the NAP is a culmination of extensive studies of the experience of other nations, a review of Sri Lanka's own unique circumstances, and nation-wide consultations with citizens. The NAP, which was approved by the Cabinet of Ministers on 05 February 2019 integrates a multi-pronged strategy, premised on the four pillars of Prevention, Value Based Education, Institutional Strengthening, and Law and Policy reforms as the foundation of the country's anti-corruption plan over the next five-year period, i.e. from 2019 to 2023. In addition to the NAP, four handbooks - Draft proposal on Conflict of Interest Rules, Draft proposal on Gift Rules, Integrity Handbook for State Officials and Proposed amendments to laws related to bribery, declaration of assets and liabilities, CIABOC, regulation of election campaign finances, and whistleblower protection -were also published exploring certain identified areas which would shape the course of the drive against bribery and corruption in the nation.